Up to 15 Wash Loads per bottle. Palm oil free. Directions for use. For use in automatic washing machines, add Liquid Soap Flakes to the detergent drawer and set the programme according to the garment washing instructions. Ensure that the drum is at least half full of garments to prevent excess foam. For hand washing, fill a sink with warm water and stir in Liquid Soap Flakes according to the tablet below, then proceed to hand wash following the garment instructions and rinse thoroughly. Suitable for the gentle cleaning of delicate fabrics and hard surfaces. Breathable outdoor fabrics. Wool, lace, silk, leather. Regular laundry - especially for those with sensitive skin. Use a dilute solution to suit the level of cleaning: Leather settees and car seats. Wooden and laminate floors. Tiles including delicate, natural stone. 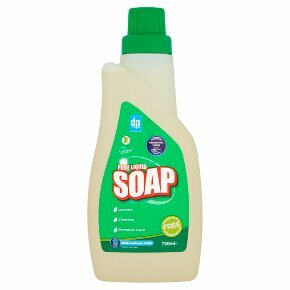 Machine or hand wash. Soft Water 40ml 1 x capfuls. Medium Hard Water 60ml 1.5 x capfuls. Hard Water 80ml 2 xcapfuls. KEEP OUT OF THE REACH OF CHILDREN. Avoid prolonged contact if you have damaged or sensitive skin. Always test for colourfastness before use.